Hey, Mrs. Lamb - All the Cool Kids Are Here! A number of years ago, one of my students was an aspiring film maker. He was entering a film contest with a film that he had made from start to finish - who does that? I have no idea how you would even do that! He was a great kid - I thought he was pretty confident and a great role model. So, he arranged with our principal to have a screening of his film in our theater one Friday night. I don't remember the name of the film, but it seems to me that it was some kind of spoof on Indiana Jones. I liked the kid, so I decided to go to the film screening. As I was standing there watching the kids come in, I saw him standing off to the side watching the kids come in too. He looked excited and a little nervous. I had no idea what the turnout for the film would be - how disappointing to him if NO ONE CAME! But kids were coming - and lots of kids - they really seemed interested. Finally, right before the film started, he came over to me with his eyes shining...as only a teenager's can...he said - "Mrs. Lamb, I can't believe it - all the cool kids are here!" I thought he was pretty cool...so that just goes to show you - all teenagers can use a boost to their self-confidence! Today, I am participating in the Soaring through Secondary Blog Hop! First, I would like to send a shout out to Jennifer Smith-Sloane for creating this awesome logo for our hop! Each person on our blog hop today will be featuring either a freebie through their TPT store, or a giveaway on their blog - so be sure to visit them all! Here is a list of all of the blogs participating, so if you get lost somewhere along the way, return here to get back on track! 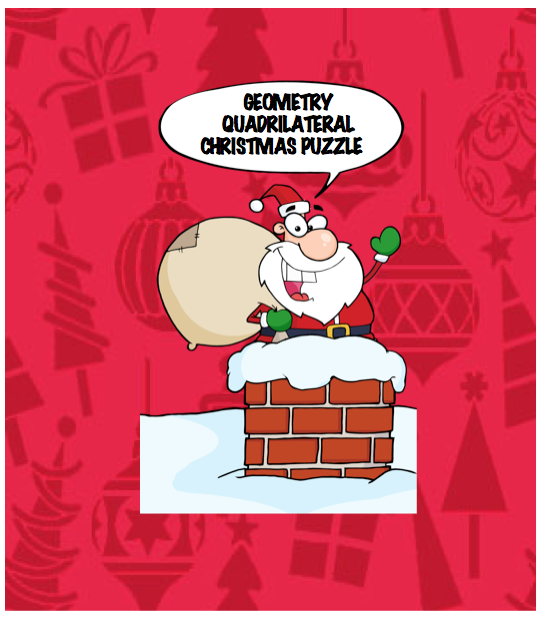 For my featured product today, I would like to highlight my Christmas Quadrilateral Puzzle. I just finished my unit on quadrilaterals with my Geometry Honors class. Since we are all getting restless and ready for Christmas vacation, I decided what better to do than to create a review puzzle. This puzzle contains 17 review questions about the properties of quadrilaterals. For example, students need to know things such as: there are 90 degrees in each angle of a square, the diagonals of a rectangle are congruent, and that opposite angles of a parallelogram are congruent. After the students solve the puzzle, they can match their solutions to a letter to solve a funny Christmas joke. As a thank you for participating in our blog hop today, I will randomly choose one person who makes a comment on this blog entry to receive one item of their choosing from my store. Share something you are doing in classroom to combat the before Christmas craziness! Blog comments will close midnight on Sunday. I will choose the winner on Monday - please return to my blog on Monday so you can find out who won and claim your prize. Woo-hoo - I am excited. I received my Texas Instruments Navigator system in the mail today. Thank you to Texas Instruments who provided a free system to our school in exchange for sending in calculator proof-of-purchases! This system will allow me to send and receive documents to and from my students wirelessly - saving paper and time! Also, as students are working on documents, I will be able to see all of their calculator screens on my computer screen - how cool is that : ) Not only can I be sure that all students are on task, but I can also poll my students. I have installed the software on my computer, and now I am ready to try putting the "hat" on top of my calculator which will allow my calculator to communicate with the wireless server. So far, I am a little confused about the logging in process. However, we had a workshop here last year and it was an easy process then, so I am sure I will get it figured out. I am really looking forward to using this system with my students. 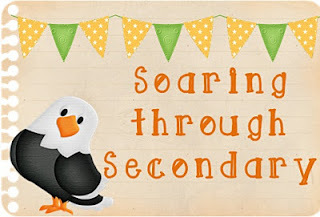 Stay tuned for a High School Teachers Blog Hop on Saturday! I have just finished the quadrilaterals unit with my Geometry Honors class. I have found several things on Teachers Pay Teachers that have been very helpful for me. So, I would like to feature my top five here. 3) I like to use a couple of worksheets during this unit so students have lots of algebraic practice finding missing parts of quadrilaterals. I didn't find quite what I wanted this year - maybe that is something I can make next! 5) Finally, I would like to show you my own Quadrilateral Christmas Card Project. 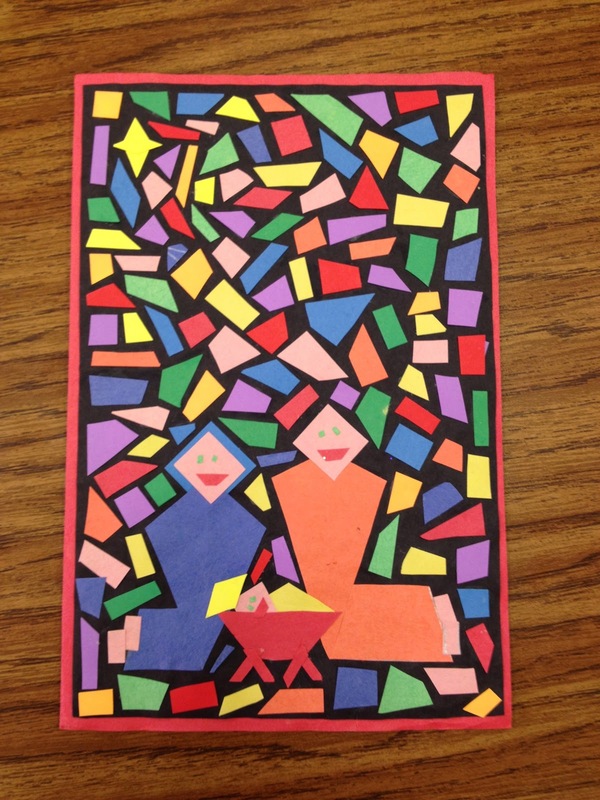 Basically, in this project, students use all 6 (square, rectangle, rhombus, parallelogram, kite, and trapezoid) of the quadrilaterals we have talked about to make a mosaic style Christmas card. Here is one of my favorite cards that any of my students have ever done. Can you see how all of the pieces are quadrilaterals? 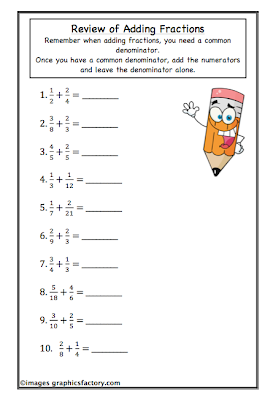 Sneak Peek of my Fractions Workbook - NOW AVAILABLE! The above links are FREE worksheets in my TPT store. They show the general format of the worksheets. 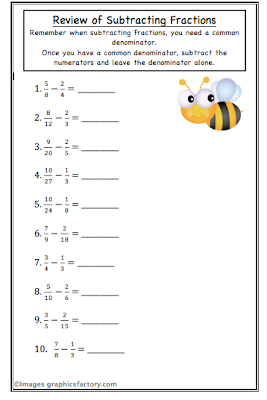 The workbook will contain all new pages for each of the 12 worksheets listed above. 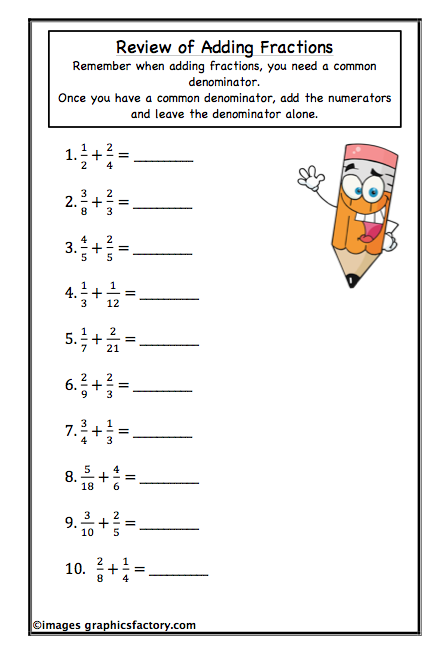 If your 4th, 5th or 6th grade math students need fraction practice, these worksheets that are ready to go will help you! Answer keys for each worksheet are included. Do your students detest fractions? I know mine do - even the kids that are in my AP Calculus class hate it when a problem involves fractions in any way. Although they CAN work with fractions, if they can avoid it, they absolutely will! I have thought about this and observed students in action with fractions for a long time. I feel like fractions are a dividing line between students "good" at math, and those that struggle. I suppose there are some students in between, but mostly I feel like fractions is the place where kids either GET IT, or they start to lag behind. Why is that? Maybe it's because to work with fractions, you have to know some rules. To use some rules, you have to memorize them. (e.g. If fractions have a common denominator, you can add or subtract them. If they don't you have to get a common denominator...how do you get one, etc.) Some students are not good math rule followers or memorizers. Why? I don't know. Some kids just refuse, but some just struggle, even though they try. What can we do to help students with fractions? How Do You Group Your Students? There are lots of ways to put your students into groups. I have a couple of ways that I am using to put my students in groups right now. 2) At the beginning of the year, I just randomly assign groups of 4 based on the seating chart. My classroom is arranged in the standard 6 rows, with 4 or 5 seats in each row. At the beginning of the year, I seat the students alphabetically, so the groups of 4 are made up of the students who sit closest together. I change the students seat's each quarter, so their groups change. After the first quarter, I can arrange the groups so they are more helpful. For example, I try to put two girls and two boys in each group. I pick out the top 8 students and separate them one to each group. I do the same thing with the bottom eight. Then the middle groups are mixed together. It seems to help. I like this arrangement because the students always know who they are working with. They can get into groups quickly. Also, I try to make a point of having them exchange phone numbers so they have someone to call if they miss class, or need help at home. 3) By the time the students are in AP, they kind of catch on to how you are making the groups, and you need to mix things up. They, even more than the younger kids, want to make their own groups. Everyone wants to be partner with whoever they consider to be the smartest kid in the class. I certainly don't want to make the groups because all of the students want me to put the "smartest" kid in their group. Here is my favorite way of putting the AP students into partners. Please enjoy the TPT sale on Monday and Tuesday! Teachers Pay Teachers is Hosting a Sale! If you have been following along, you know that I have been contributing to the teacherspayteachers.com website. Monday and Tuesday (November 26 and 27), the site will be having a sale. Each individual seller can set up their own store on sale (up to 20% off) and then the TPT website has a code you can enter to get an additional 10% off! If you have ever visited the site, you know that there are awesome ideas! 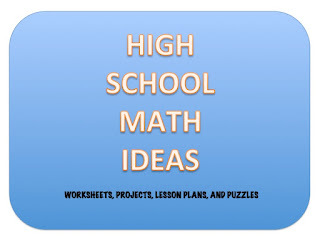 There are projects, worksheets, and ideas galore - for every grade level and topic. Please visit my store to take 20% off anything in my store, and then use the code given in the graphic below to get an additional 10% off. I realized something about myself today...it's really weird...I count things. Yes, I know you are thinking a math teacher that counts things...of course you do! But, I realized that I count things without knowing I am counting them. Like, for example, when the copy machine is copying, I realize in the middle that I am on copy 47. Have you ever played the game where you have to guess how many things are in a jar? When I look at something like that, a number comes to me - I don't calculate anything, I just think of a number. I'm always pretty close to the number of things in a jar. Years ago, I had a student - Emily her name was - she is probably the best math student I have ever had. She could just see things that the other kids couldn't. She was also my student aide. She was in my office one day when she got out a box of tic-tacs. One of my other aides said, "Hey can I have one?" I watched Emily slowly - as slowly as she could, hand over the box of tic-tacs. She obviously didn't really want to share, but couldn't think of a reason not to. Later, after the other student left, she said, "Did you know that there are almost always 36 tic-tacs in a package? I usually try to eat them 4 at a time so that I will have an even number in each serving of tic-tacs." Therein lay the problem that she was faced with when she was asked to share - who knew how many tic-tacs the other person would take? If she didn't know, she was likely to end up with an odd number of tic-tacs at the end of the package. Not a comfortable feeling for her! There are some great high school materials listed. You should already know that! I hear it from my department members all the time - the PreCalc teacher says why didn't you guys teach trig well enough last year, the Algebra 2 teachers says why don't these kids know how to factor, the Geometry teacher says why don't these kids know how to simplify a radical, and the Algebra teacher says why didn't those teachers in junior high teach these kids how to work with fractions?? Well, we each know that we could do it better - if WE were only the ones teaching those kids the year before, they'd know all these things! Until you do...until you know you're the one that taught them the year before - you know you taught how to factor a difference of cubes, and then when it comes up in calculus they look at you like you have two heads! You know you had these same kids in geometry, but bring up the relationship between the sides of a 30, 60, 90 degree triangle and blank looks glaze over those otherwise smiling faces. What to do - how to solve this problem? To be honest, I have had several foreign exchange students over the years, and it seems like they never forget. They never have any computational trouble whatsoever, ask them to factor - no problem, convenient values of trig functions - right there on the tip of their tongue. When you're a math teacher, you need a bag of tricks that you can reach into for those moments when some part of the lesson went faster than you imagined - or maybe there was an assembly scheduled that was suddenly cancelled and you are left with your class for 90 minutes (instead of the usual 45 you are used to)...that happened to me last week! Sometimes you might just be able to continue with the lesson on the fly depending on where you are, but sometimes you just have to reach into you math teacher bag of tricks. Here is one of my favorites that usually takes freshmen or sophomores at least 20 minutes before they want to give up or someone finally gets it. (Junior high students can mathematically do this problem too). One day I went to visit my friend George who is a mathematician. I went inside and had a nice visit. I saw a picture of his three children hanging on the wall. I asked him, "How old are your children?" He said, "The product of their ages is equal 72." I said, "That doesn't give me enough information to tell how old they are." He said, "The sum of their ages is equal to my house number." I went outside to look at the house number. I scratched my head and went back inside - I said to George, "That still isn't enough information." He said, "You're right, I should also tell you that the oldest one likes ice cream sundaes." I said, "Oh, now I know, their ages are..."
There are several variations of this problem, but the idea is that the students have to list the possible ages of the children that could yield a product of 72. Then, they must realize that if you list all the possible sums of those products, there are two that yield the same sum. The piece of information about the ice cream sundaes is only there to help the students know which possible set of products and sums they need to use. (The two possible products that have the same sum are 3, 3, and 8 and 6, 6, and 2. Students must choose the one that only has one oldest child). Final answer is 3, 3, and 8. TI-Nspire = LOVE in Geometry class. I absolutely love that I can do constructions that used to take a ton of time in just a few minutes. I can ask better and deeper questions because the students don't have trouble making the things I am asking them to make. Mental Math - Is It Dead? I had another terrifying experience while teaching Geometry this week. I was working through a problem in our book and the last question was to find the area of a triangle with specific vertices. We had already found the coordinates of all three of the vertices and the lengths of the sides of the triangle. Our last step was to multiply 1/2 * 9 * 12. I immediately wrote 54 on the board and started to go on to the next thing...when several of the students started to say wait how did you get 54 so fast? I said well, half of 12 is 6 and 6 * 9 is 54. They were amazed that you could multiply like that - they all wanted to pull out their trusty calculators and type it all in. In fact after I explained that you could take 1/2 of either number and then multiply that by the other number, they continued to be amazed. Some of them were convinced that you need to take 1/2 of both 9 and 12 and multiply that together. Halloween Joke a Little Late: I was walking in the hall this week behind one of my fellow math teachers and I was listening in on a conversation he was having with a student. The student said, Mr. H, what are you going to be for Halloween? Mr. H said, I'm going to be a fraction - everyone is scared of them! It was an exciting class period recently in my Geometry Honors class. We switched to having our Honors Students buy TI-Nspire CX calculator this year. There was some grumbling from parents - like what is this expensive new calculator going to be able to do better than the tried and true TI-83 or TI-84. I patiently explained what I thought would be the advantages - like we can use the Geometry App, I can send the students documents using the TI-Navigator, and my personal favorite - there is color. I have been working with the students recently on altitudes and medians. We talked about the centroid and the orthocenter. For some reason I like talking about the Euler line - it's just cool! I usually have the students draw a triangle and we draw the medians. I have them cut out the triangle and balance it on their pencil at the centroid. They think that part is neat, but the measuring and drawing in the medians - it's painstaking...as embarrassing as it is is, there is always someone - even in honors math that doesn't use the ruler correctly, etc. This year I decided - hey we have this cool new piece of technology, let's try doing this activity on the Nspire. Needless to say, it took about 1/4 of the time. The kids loved it. They showed me some new ways to do things, and I was able to fill in lots of other information at the same time. For example, I could show them how the medians ALWAYS intersect in the centroid by having them drag the vertices of the triangles. And, I could convince them that sometimes the altitudes DO go outside the triangle - they could tell me when that happens (when the triangle is obtuse) instead of me having to draw several examples and hope they believed me. Also, I used a great activity from Teachers Pay Teachers from Emily Allman. She designed it as a performance task. I really enjoyed using it. 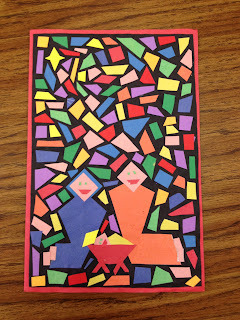 Check it out Triangle Centers Performance Task. Thinking About Geometry Proofs - Do They Get It? Another year and another chance to teach students about Geometric Proofs...however, they are all starting to seem the same to me - how can the students not see another another set of vertical angles - another line that is shared by two triangles - JUST WRITE DOWN REFLEXIVE ALREADY! I often wonder if the students really understand what we are doing here - or are the students that are successful at proofs the ones that are super good at copying what I am doing? Do students honestly understand that SSA can't be used to prove triangles congruent, or do they think that I just don't want them to use those combination of letters because they spell a bad word if you look at it backwards??? I think that when I show students later in the year a "proof" of the Pythagorean Theorem - note: no two columns involved...that they appreciate a teenie tiny bit of the beauty of mathematics. But, back to these congruent triangle proofs...I am open to suggestions on making them more exciting and fun - do you have any suggestions?? 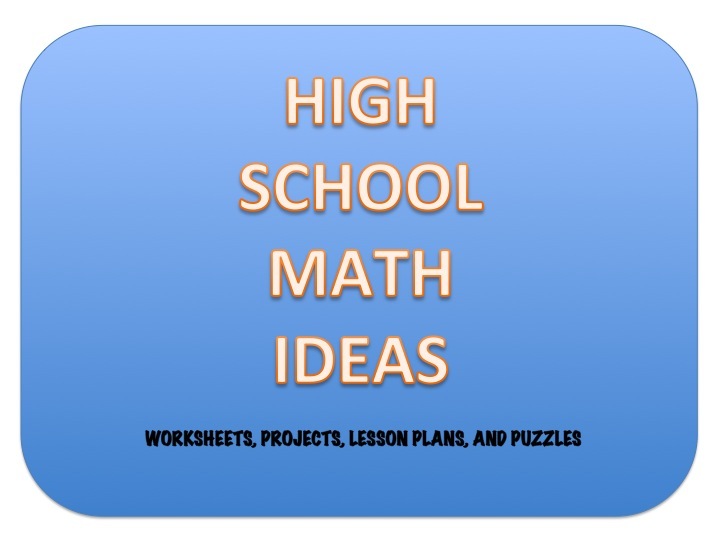 One thing that I think is very important in high school math is that students master certain basic skills. However, it is very frustrating as time after time, students don't master them! So, I thought about it for a long time and decided that there are some skill based things that students absolutely HAVE to be able to do...how are they supposed to solve harder problems without being able to do basic things? So I decided to start using the idea of a competency test in my classroom. Here's the idea. I have 5 different competency tests each quarter. Each one is worth 10 points, so a total of 50 points. Students have to keep taking the competency test until they achieve a score of 10/10. This quarter I used the idea in my calculus class for the first time. The 5 competency tests were: 1) Factoring, (2) Writing Equations of Lines, (3) Trigonometric Convenient Values, (4) Right and Left Hand Limits, (5) Basic Derivatives.